new data supports the hydroton prediction that the amount of tritium is related to the deuterium to protium ratio in the fuel…. Caption of the chart from Storms (2016): Figure 13. Relative rates of formation for deuterium, helium, and tritium as a function of d/(p+d) in the NAE. The figure approximates ideal behavior when the concentration of NAE and temperature are constant. Unknown influences are expected to slightly modify the relationship. The concentration of p is 100% in the metal on the left side of the figure and d has a concentration of 100% on the right side. I have not seen such data. If there is actual confirmation of the tritium prediction, as shown in the chart, that would be quite strong evidence supporting Storms’ theory. completed before enough energy has been lost from the adjacent d and p for them to form tritium. 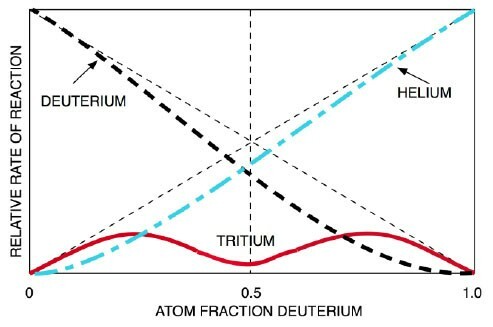 Thus, the rate of formation of tritium first increases as p is added, then is reduced as the atom fraction of p in the hydrogen mixture approaches 0.5 where the deuterium and helium formation reactions dominate. Storms does not quantify this effect. He does not specify that the rate of energy loss is the same for p as for d, but the energy release process is shared in alternating pairs. His claim of early completion of fusion for p-p pairs does imply that the rate is the same — but I have never seen Storms fully address the issue of inhomogeneity along the hydroton. The process he describes would have the reacted pairs vacate at least one of the positions in the hydroton to be replaced by new fuel. With H/D ratio = 1, what would happen? Imagining that the energy release process removes about the same amount of energy from each nucleon with each cycle, and that d-d requires 12.9 MeV per nucleon, p-d requires 2.45 MeV, and p-p 0.95 MeV, and neglecting reloading time, and, as well, the shutdown of half of the d and t process from the other half of the pair being missing, the time to fusion ratio, for d, t, and He production would be 1:2.5:13.6, so this would push production rate toward deuterium over tritium and tritium over helium. The chart does not appear to reflect that; it is, rather, symmetrical. I don’t know how that chart was calculated, it shows deuterium being equal to helium at H/D 1.0. 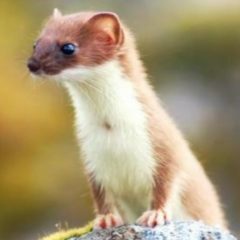 However, what does the hypothesis predict as to what is known? H/D ratio is not always reported, and there is a problem with heavy water, it is hygroscopic, i.e., it absorbs light water from humidity in the air, which will increase the H/D ratio. Storms had found previously, shown in his book as Figure 67, p. 133, that 1.6% H (atom percent) (in the electrolyte) can poison the excess heat. This figure was from his on-line published 2001 paper. As he points out, there is a separation factor favoring hydrogen evolution and loading into the palladium, over deuterium, and he gives an example where a cathode loaded to 25% H when electrolyzed in 99.9% D2O, but another study defined a separation factor of 9.2-9.3. The first Fleischmann and Pons report (1989) used 99.5% D2O. Assuming 0.5% H, the H in the palladium could approach 5%. Given the preferential production of tritium over helium, there should have been not just a little tritium, rather a lot. The numbers I have commonly used to compare helium, tritium, and neutron production is that tritium is roughly a million times down from helium, and neutrons are about a million times down from neutrons. Because of the studies that looked for tritium and neutrons, the latter figure has some substance. The former is a very rough estimate. But say we have 0.1% H from using 99.9% D2O. That would become 1% from the separation factor. The tritium production should then be at least 1% of the helium production, plus an increase from the faster fusion time. It is far, far less. Storms’ theory does not appear to match experimental evidence on tritium.